Robben celebrates his 93rd Bundesliga goal for Bayern, which earned him two new records. 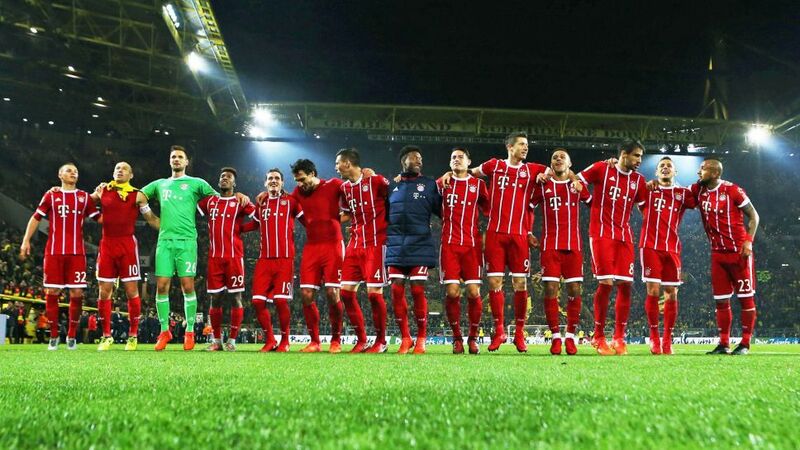 Seven games, seven wins: Bayern Munich have rediscovered their mojo since Jupp Heynckes returned last month, and Saturday's 3-1 win over Borussia Dortmund in Der Klassiker hammered home the fact that the record champions remain the Bundesliga benchmarkers. Heynckes delivered a Bundesliga, DFB Cup and UEFA Champions League treble as he signed off, seemingly for good, in 2013. A key man for him that season was Arjen Robben, and there is a sense of deja-vu about the Dutchman's performances since Heynckes returned. With a swagger in his step, the 33-year-old has turned back the clock, and broken two more records in the process. "We've raised the bar again in terms of our football," Robben told reporters after Bayern's Klassiker victory. "This was our best performance of the season; we played like a team again." Heynckes concurred, branding his team's performance "super" as they opened up a four-point advantage over RB Leipzig at the top of the Bundesliga, and moved six clear of Dortmund. By comparison, he took over a team who trailed the Westphalians by five points just a month ago. "If you think of the ground we've made up in the table – it's crazy!" said Robben. "The way we've come through the past few weeks, I as captain have got to say that I'm really proud of the team. "The way we've coped with all the injuries and been able to keep up with the rhythm of a game every three days, and to have won seven out of seven. It's incredible!" One name in particular is synonymous with this success: Heynckes. "We've got to pay him a huge compliment," continued Robben, who became the Bavarians' all-time top foreign goalscorer in the Bundesliga with his 93rd goal at the weekend. The 72-year-old shows authority, albeit without getting anybody's back up. He finds the right words for every situation and has managed, with just minor tweaks – such as advancing Javi Martinez into midfield – to restore the 'Mia-san-mia' gene which has sustained Bayern's remarkable success in recent years. Seemingly empowered by the captain's armband, in the absence of Manuel Neuer, Robben has stepped onto a new level too, his 93rd Bundesliga goal also ensuring he is the most prolific Dutch player to have played in Germany's top flight, dislodging former Dortmund and Rot-Weiß Essen forward Willi Lippens. "I love games like these," Robben enthused. "Two records – that's a good reflection of my time here at Bayern. But what I'm most pleased about is that I've played from the first to the last minute of every game under Heynckes, and I'm still fit. That makes me proudest; being so fit at 33 is the best feeling." Nine of those 33 years have been spent in Munich. The experience gained from that time also tells him how quickly things can change, and not just in terms of his own physical condition. "We're all in a celebratory mood now, everything's fantastic and amazing, but we've got to keep our feet on the ground and keep calm," he said as people begin to ask whether Bayern can win another treble under Heynckes this season. "We're only just at the beginning of November," he said. "We've got to nip that in the bud. Our performance against Dortmund was good, but we know we can do even better." Again, his thoughts mirror those of his coach, who believes that "when everybody is fit, we can play even more attractive, better football." If Bayern's win in Dortmund, Robben's record-breaking form and that statement were not a warning to Bayern's rivals in Germany and Europe, then what is? Click here for more Klassiker reaction, Bayern news and features!